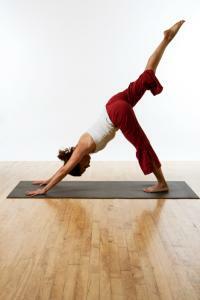 The Downward Facing Dog Pose, or Adho Mukha Svanasana, stretches the entire body. Adho Mukha Svanasana is comprised of three words: adho means "downward," mukha stands for "face," and savana is Sanskrit for "dog." Start on your hands and knees, legs hip-width apart, hands flat, fingers spread. Inhale deeply, and on the exhale, lift your knees, pressing your toes into the floor. Move your legs back while at the same time raising your buttocks toward the ceiling. Don't lock the knees. Pull the tailbone in, straighten the arms and extend forward through your fingertips. Rotate your biceps forward to expand through your back. Straighten your legs by resting your heels on the floor. Lower your head between the upper arms with purpose. Hold this pose for a minute or longer, and on an exhale, and release into Child's Pose. If your hamstrings are tight, gradually lower your feet with each practice. You may also want to try bending into your knees to relieve some of the tension in your hamstrings. You can also "walk your dog" by pedaling out your feet to release your hamstrings, or you can try "Puppy pose" by placing your knees on the ground as your head, arms and shoulders remain in Downward Facing Dog. If you have troubled shoulders, try this pose with your hands stretched on a chair. Once your form is perfected, raise your right leg as high as you can straight out behind you. Keep your leg straight and your foot flexed. Square your hips to the ground, point the toes on your lifted foot, then rotate your hip outward and hold for 30 seconds. Repeat with the other leg. This is a resting pose that will help rejuvenate your entire practice. Learn to find the stillness in this posture to help unlock all its benefits.